On this page you will find a list of restaurants in Brussels, tried and tested by the American Club of Brussels! a proud corporate member of the ACB! 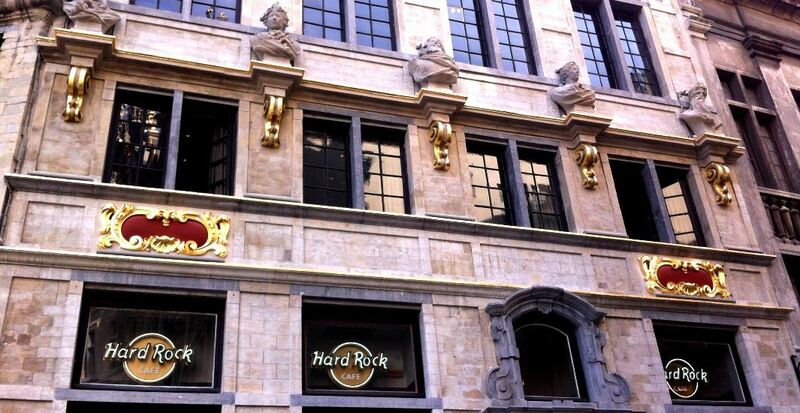 Located in a restored 16th century building in the heart of Brussels, right outside La Grand Place, the Hard Rock Cafe is a classic go-to restaurant for delicious food! With weekly live-music events and amazingly decorated with music memorabilia and other artifacts, the Hard Rock has an unforgetable atmosphere! a proud corporate member of the ACB! The restaurant bills itself as fresh Mexican food, California style. In an informal setting, food ordering is at the counter before seating, and will be sure to sate any craving for American or Mexican food! a proud corporate member of the ACB! Authentic American burgers, with delicious taste of New York made with grass-fed matured beef, Little Italy homemade buns, Belgian hand-cut fries and Brooklyn lager. In an informal setting, food ordering is at the counter before seating. This is a charming Mediterranean restaurant with a Greek flavor, located on the Rue Jordan, a bustling pedestrian street just off Avenue Louise in St.-Gilles. Located in the heart of brussels, Bij den Boer is a relaxed and friendly restaurant specializing in fish and other seafood. Offering a great selection of wines to accompany their mealls, this restaurant will be sure to please. Located in a mercantile building from the 18th century, the eatery – with its whitewashed brick walls and beamed ceilings – forms the backdrop for bimonthly art events, live dinnertime jazz (or Cuban) on weekends, and just plain dinner. The food is Med-French, inventive and refined; the service is attentive; the ambiance agreeable; and the prices reasonable. Centrally located in a venerable building in downtown Brussels just steps from the Manneken Pis, Bleu de Toi is noted for its special preparations of the humble baked potato. Other delicacies to tempt your palate are salmon tartare with a Japanese twist, a medley of grilled fish, and duck breast with raspberry sauce. La Brasserie de la Patinoire , so named after the old roller skating rink nearby. Located in the Bois de la Cambre, near the Théâtre de Poche, the restaurant has a warm and elegant hunting lodge ambiance, fine food, and a spacious terrace with great views of the Bois. The Café Métropole offers excellent Belgian/French cuisine in a beautiful and classy restaurant. With its high ceiling and antique wooden finish, the restaurant has a spectacular atmosphere. The Ciao Bella is a beautiful restaurant located in a side street coming from the Avenue Louise, in the heart of Ixelles. The Italian cuisine is sure to impress in this cozy restaurant, which emphasizes simple and homemade Italian dishes. Located in a repurposed 1923 villa, the restaurant serves a refined asiatic cuisine. The restaurant is beatifully decorated with original woodworks, wall paintings, rare antiquities and an aquarium as a floor! The restaurant also has a beautiful garden. Join Tintin, Asterix and the Smurfs in this trendy restaurant with fantastic decorations. This brasserie was voted ‘The Best Restaurant in Brussels’ by Trip Advisor users. Great food and great comics – two pillars of Belgian culture converge at the Grand Sablon for a unique and entertaining Dine-Out experience. Contre-Temps offers gourmet French cuisine, with an ever-changing menu as they use only the freshest ingredients of each season. Cose Cosi is an Italian dining experience like no other. Cose Cosi in the heart of Ixelles gets rave reviews for the quality of its food, its refined atmosphere, and its impeccable service. This bistro offers you a refined cuisine, accompanied by the finest wines, all at reasonable prices. A very friendly and lively restaurant, serving Tex Mex food. The restaurant doubles as a relaxed café as well as serves brunch. Delicious food in a friendly atmosphere! Close to the Avenue Brugman, in an unusual setting, quirky and full of history. Known for their delicious fondue and meat grilled on the fire, this restaurant is go-to for belgian specialities. “In the Spider’s Web” in the local Marolles dialect – provides a wide variety of classic, beer-based dishes. The restaurant is set in an old stagecoach inn dating from 1762, and the cozy wooden paneling, the sloping tiled floors, the antique advertising posters, the walls the color of real ale, the menus in dialect, all conspire to make you believe you’ve discovered the “real” Brussels. Just a few steps away from the Grand Place in Brussels, L'Estrille du Viewux Bruxelles is an enchanting restaurant, serving delicious seafood and other Belgian classics in a warm and comfortable atmosphere. Spectacularly decorated with Breughelian paintings and the graces of many other famous painters, L'Huitriere has a wonderful ambiance.The restaurant serves delicious Belgian food as well as fresh seafood. Overlooking the Brussels market area, this restaurant/café has a fantastic view to go alongside their great food and extensive beer list, all at very agreeable prices! La Mirabelle offers excellent Belgian/French cuisine, and if weather permits a lovely outdoor terrace. La Quincaillerie is a converted hardware store, which has become the home of delicious Belgian cuisine, known in particular for its seafood. Located near the Place du Châtelain. L’Autre Cantina, a Brazilian restaurant known for its good food and pleasant atmosphere. Beautifully decorated, the restaurant has a high repuation amongst Brussels diners. Le Bugatti restaurant, opened in 1988, and specializes in Brussels and Belgian cuisine. The building had been the garage annex to an Avenue Louise mansion dating from 1885. The building is full of history, which the owners are committed to preserve in order to impart the atmosphere in which to enjoy the flavors of their “terroir”, entirely developed in their home. The food is an exciting mix of cuisine from all over the world. The restaurant does a very good job at selecting traditional dishes as well as lesser known delicacies from countries as diverse as Argentina, China, Greece, India, Italy, Peru, and Thailand. This is a very special Greek and Polish restaurant. The husband is Greek and the wife Polish, and this intersting mixture is reflected in their delicious meals. A Belgian cuisine restaurant, tastefully decorated with paintings depicting Belgian history and culture. They are known in Brussels for their delicious moulles and frites, and other 'spécialité bruxelloises'! It is a highly rated French-Thai fusion restaurant that has gained a huge following. Le Crabe Fantôme, nestled in a quiet street in Boitsfort, offers delicious food in a very cozy atmosphere. Le Petit Pont, a very popular Uccle brasserie, on the old town center surrounding the 18th century Eglise Saint-Pierre. This restaurant welcomes with atmosphere, great food and service, and with the interesting warm décor, elegant curving stairway, and beautifully forged ironwork. They feature seasonal fare and fresh produce in their extensive menu. Le Quartier Latin has a friendly yet modern décor, and the restaurant offers a beautiful patio. The menu has exquisitely reinvented many classic Belgian and French specialties, served by a very friendly staff. A restaurant placed just outside of the Grand Sablon, serving authentic Greek food. Well decorated and reasonably priced for such good food. The design of the restaurant is a classic mix of relaxed and smart, with exposed red brick walls, wooden floors, authentic railway carriage benches, tables from another century, and original art in old gilt frames. The owners-chefs and their culinary team concoct some truly creative gastronomic delights, many with a Mediterranean touch, but also with excursions and explorations into other continents. Les Foudres restaurant has a beautiful atmospheric setting of a re-purposed antique wine cellar. If you're looking for a gourmet meal accompanied by fine wines, this is the place! Near the Palais de Justice, Les Larmes Du Tigre takes its customers on a journey through the delicious flavors of Thailand. Offering great food and great service, all at a reasonable price. The fabulous L’Huîtrière placed in the heart of Place Ste. Catherine is known as one of Brussels most famous fish restaurants. A tastefully decorated restaurant hosting the unique flavors of Lebanon. The staff are friendly and the food is great! Presided over for many years by Maitre George, the Mont Liban offers typical Lebanese specialties in an old-world atmosphere. The food is excellent; the setting is designed to guarantee conviviality. Nakama, located in the avenue Louise area offers an unforgettable Japanese dining experience. Restaurant Pizzeria Da Claudio's Italian food comes highly recommended for a number of reasons; its delicious food, fun ambiance and fair price. Poivre et Sel, an authentic Italian restaurant nestled close to Place Luxembourg. Awarded a certificate of excellence from Tripadvisor, Poivre et Sel comes highly recommended as 'a breath of fresh air' and with authentic Italian cuisine. Right in the middle of the European quarter, it offers a fresh approach to Mediterranean food. Emphasizing 100% homemade Spanish and Italian dishes, using fresh and/or bio ingredients and daily vegetarian dishes. They specialize in homemade fare such as grilled octopus, or chicken rolls with Serrano and Mozzarella. They also offer a wide selection of tapas. Poussières d'Étoiles An authentic Vietnamese restaurant, serving great food with a very classy yet relaxed ambiance. The service is great and the food is reasonably priced. Very close to the Grand Place, Scheltema is a tastefully decorated restaurant serving delicious food with great service. The establishment is known for its seafood specialties and its turn of the century pub ambiance. Relaxed and friendly Italian restaurant, offering pizza's baked over wood fires and a wide range of home-made pastas. Well decorated, nice staff and good prices. STEAKfrit’ is a small chain of local restaurants that offers a selection of traditional and familiar Belgian dishes prepared with top-quality ingredients, served in generous portions, and fairly priced. This is feel-good food at its best. Au Stekerlapatte has been around for decades and continues to be one of the landmark authentic Belgian restaurants in the heart of Brussels. For lovers of authentic Franco-Belgian cuisine, the restaurant – which means “fresh water fish” in the local Marolles dialect – provides a wide variety of traditional dishes in the typical atmosphere of a Belgian brasserie. Enjoy popular hot and cold mezes and side dishes shared among friends at one of Brussels’ most talked-about authentic Greek restaurants located near Place Ste.-Catherine in the heart of the city. Wok and Roll, a funkily decorated restaurant serving a delicious asiatic cuisine.